Firefighters participated in a simulated vessel fire exercise during the 2015 Marine Firefighting Symposium at the Valdez harbor. Photo by Zac Schasteen. Update 2/9/17: Registration is now open! See Marine Firefighting Symposium 2017 for more. The ninth Marine Firefighting Symposium for Land-Based Firefighters is scheduled for May 12-14, 2017 in Homer, Alaska. The council is co-hosting this event with our sister organization, the Cook Inlet Regional Citizen’s Advisory Council. The council is pleased to have its nationally renowned training cadre of John Lewis, John Taylor, Don Ryan and Ron Raschio, led by Jeff Johnson, returning to the Symposium. Several of these instructors provided input and material for the land-based shipboard firefighting manual produced by the International Fire Service Training Association. Firefighters and industry participants consistently provide positive comments on the events. The council is able to offer this training at no cost for participants. 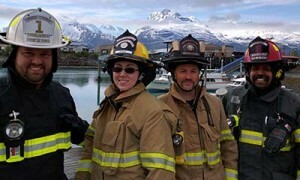 Unalaska and Valdez firefighters at the Valdez harbor. Photo by Zac Schasteen. A shipboard fire is dreaded by all mariners. When a fire occurs at a dock or a burning ship is brought into port, local fire departments are expected to respond. Since most communities in Alaska are located along a river or the coast, it is prudent to prepare for a vessel related incident. Techniques used in marine firefighting are quite different than those normally employed in structural fires on land. To better prepare land-based firefighters for such incidents, the council developed the Marine Firefighting Symposium which is held every two years. This past May, the council hosted the eighth edition of this symposium in Valdez. 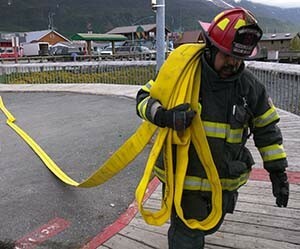 Thirty-eight firefighters from 14 different Alaska communities, ten marine fire and salvage industry representatives, and fire officials from Alyeska, attended the three-day event. A firefighter practices on live fire in a controlled situation during the 2013 Marine Firefighting Symposium. The 2013 Marine Firefighting Symposium was held October 8-10 in Seward. 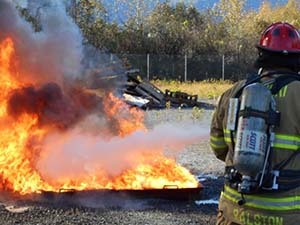 Through partnerships with the Seward Fire Department and AVTEC – Alaska’s Institute of Technology, this year the symposium included live fire training for the first time. Participants came from all parts of Alaska. The 39 participants and eight facilitators represented a mix of communities and industry. Attendance numbers were lower than previous symposiums due to several factors, including the federal government shutdown.